How long ago was 1908? The city of Chicago has officially gone crazy for the Cubs. The Chicago Tribune sets up an electronic scoreboard outside their headquarters at the corner of Madison & Dearborn to provide “scoring updates” of the Cubs-Giants games in New York. The electronic scoreboard is nothing more than a diamond shape with light bulbs representing the number of balls and strikes, and light bulbs at each corner of the diamond, representing the bases. A scoreboard operator keeps an eye on the ticker, and manually adjusts the light bulbs as the news comes in from New York. Thousands of people turn out to see the only live updates in Chicago. In New York, the city is just as crazy for their first place Giants. The New York Herald estimates the crowd for the first game of the series at 50,000. Only 30,000 or so can get in the ballpark, and that pushes the crowd to a new limit. Some of the spectators are sitting as close as ten feet away from the foul lines. Those that can’t get in, don’t go home. They stay to be as close to the action as possible. People are literally hanging from the rafters. The crowd covers several city blocks. The Cubs also win the second game of the series in front of another huge crowd as Mordecai Three Finger Brown outduels Christy Mathewson. The Cubs are continuing to gain ground on the Giants, and are now only 1 1/2 games out of first. For the last game of the series, Jack Pfiester, who had just pitched two days earlier, is sent to the mound again. He beats the Giants one more time, vaulting the Cubs within sniffing distance of first place. 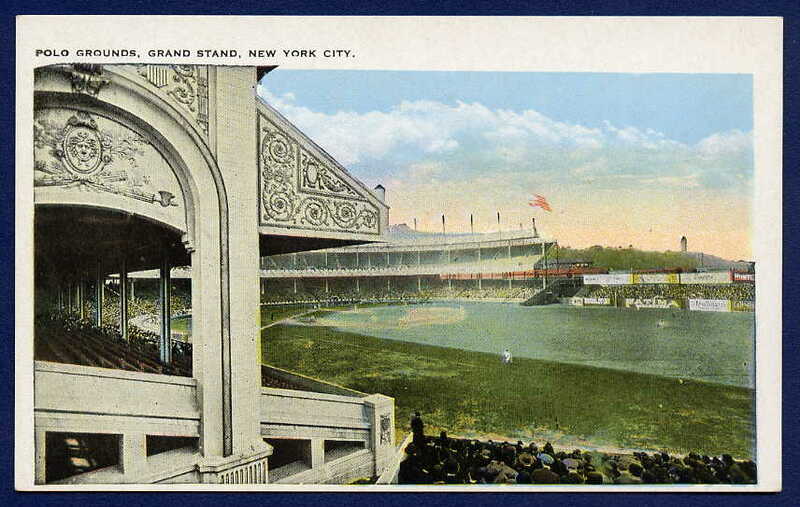 The Polo Grounds crowd is incensed that their Giants lost all three to the defending champs, and the Cubs are forced to run for their lives after the game. They escape with only minor cuts and bruises. Jack Pfiester, who won two of the three games, leaves town with a nickname that will remain with him for the rest of his career…The Giant Killer. 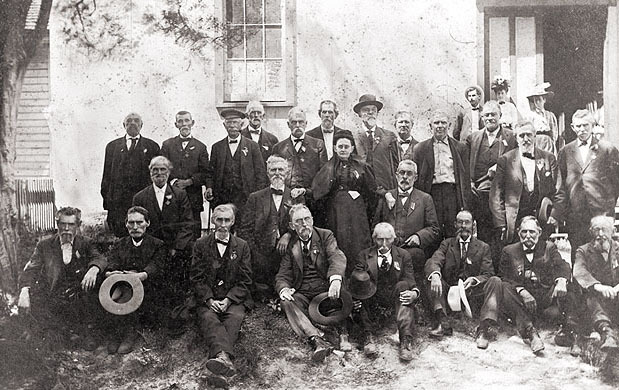 *Confederate soldiers hold a reunion in North Carolina. *The old timer on the pitching staff, Chick Fraser, celebrates his 35th birthday (Aug 26). 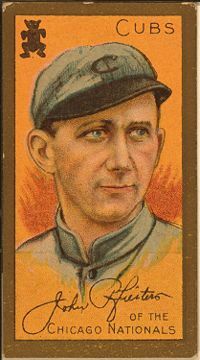 He once no-hit the Cubs (1903) while pitching for the Phillies. 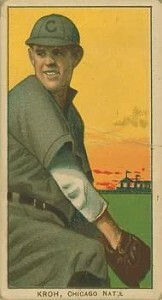 Fraser is a headhunter, and is still 5th on the all-time hit batsmen list behind Walter Johnson, Eddie Plank, Randy Johnson, and Joe McGinnity. Fraser will be summarily fired from the team next season by Frank Chance, when Chance sends him home to get his arm ready for a series, and Chance discovers he hadn’t shown up at the ballpark at all. *Cubs pitcher Rube Kroh, the guy who will help the Cubs win a pennant (with a punch) in a few weeks, celebrates his 22nd birthday (Aug 25). He only pitches 12 innings for the Cubs in ’08, although he’ll win nine games for them in ’09. By his 26th birthday, his career is over. *On August 27th, future President Lyndon Baines Johnson is born in Texas. *Fred MacMurray is born on August 30th in Kankakee, Illinois. He will first gain fame as a singer, before turning to acting. *Leo Tolstoy is still alive. He turns 80 on August 28. Tolstoy is one of the most widely respected men of letters in the world; ever since he wrote “War & Peace” thirty nine years earlier. Price Check: Miniature fruit lamps in the shapes of peaches, pears, apples, and oranges are 25 cents a piece, or $2.75 for a dozen. If you travel back in time, don’t challenge someone to a game of Scrabble. It won’t be invented until 1931.